A Family favorite, this slow cooker pot roast recipe is a wonderful way to enjoy cheaper cuts of grass-fed beef. The subtle orange flavor imparted by Tamrind paste or orange rind makes a delicious sauce. This is one of our favorite slow cooker recipes. Pound meat lightly or pierce with a meat tenderizer and marinade several hours at room temp or overnight in the refrigerator in a large bowl with the red wine vinegar. Dry well, discard vinegar. Place cut up potatoes and parsnips / carrots in bottom of 7 quart crock pot. Place meat on top. Mix / whisk together stock, tomato paste, balsamic vinegar, tamarind paste, garlic and dried peppercorns in a medium pot over medium heat until well blended. Pour over meat and veggies in the crock pot. Cover and cook for 10 hours on low or 5 hours on high. If at home, you can set your slow cooker on high for first 3 hours then turn down to low for 4 hours. Remove meat and veggies to a platter. Remove herbs (if using fresh). Pour sauce into large frying pan and bring sauce to a boil on high heat. 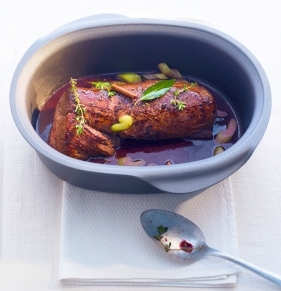 -or- Simply turn your slow cooker to high and remove the top (takes a little longer but easier). Allow to reduce by almost half and season with salt and pepper. For Thicker Gravy: Add some flour or Arrowroot powder that has been mixed well with cold water. For No/Low Carb: If using guar gum / xanthan then add to sauce and blend in blender on high BEFORE putting into frypan and reducing. A great way to reheat your pot roast: Place slices of pot roast on plate (1 layer thick) along with the potatoes and carrots/parsnips (again only single layer). Pour sauce over potatoes and meat and heat in oven at 350 degrees for 20 minutes. Sauce keeps meat from getting too dry.